I went on my first trip to Italy last week, 2 hours on a plane and I was standing on pretty Tuscan hills looking at a rolling patchwork quilt of hills covered in olive trees and vine yards. We had the joy of staying with the American family of Husbandface, people who describe him as their adoptive son whose parents haven’t quite let go of him yet. Lovely times with lovely people. I didn’t learn much Italian, I did drink a lot of very good wine, I loved the sights. We also exchanged cultural differences with the lovely Americans. The most shocking, as those of you who know me will appreciate, was the surprise that every house in Britain (husbandface and I mostly put aside our own Irish/English differences to gang up on the Americans :)) has an electric kettle. The shock, the surprise, the amazement that even hotel rooms have their own kettles. I find it hard to imagine such a nation could still claim to be so advanced technologically. Or maybe I should be shocked at the elevated status of tea in our own fair nation. On second thoughts, I won’t, tea should be drunk frequently and often. Maybe I’ll start a campaign along with Jamie Oliver. Stunned at the lack of tea drinking and correct items to make a cup of tea I shall travel American converting them to my ways and saving them from bad cups of tea. Apart from the cultural learning we had a number of highlights: Cooking lessons from proper Tuscan chefs, olive oil tasting, wine tasting, wine drinking, learning what wine goes best with what food, drinking more wine, getting to meet the honorary Aunts Jeanie and Judi, hanging out in hill towns with Tom and Rachel, introducing them to Cunningham style holidays- look at a pretty building- sit in a coffee shop- repeat until time to go back, being cooked for by a real Italian Mama, Federico and his vineyard, amazing food, sitting reading by the pool, soaking up the grace of the Cantrells, deep chats about everything and anything, the Sat Nav’s pronunciation of Italy- Titaly, more wine and pretty pretty views everywhere we looked. 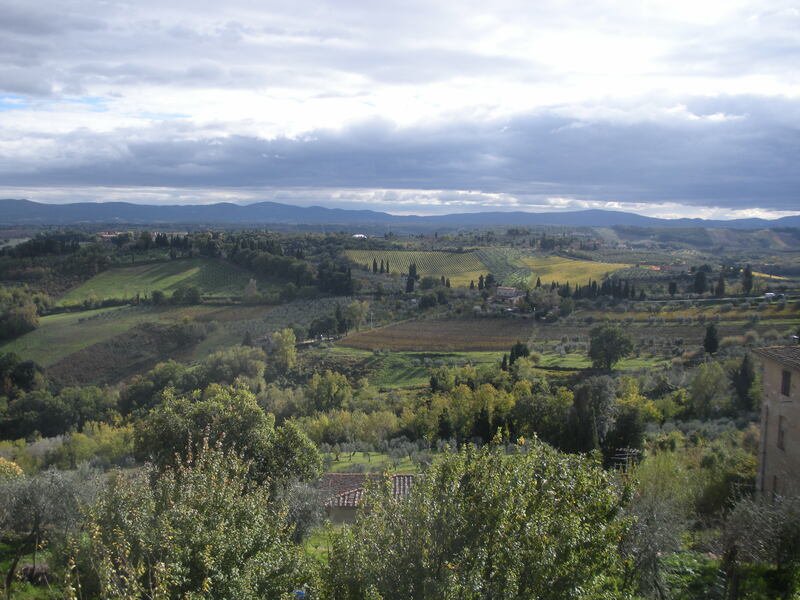 This entry was posted in Life on the journey and tagged tea, tuscany, wine pretty. Bookmark the permalink. I want to go there now just to hear my satnav say ‘Titaly’ over and over again, and never stop finding it funny.